NEWER HOME WITH MANY UPGRADED FEATURES NOT FOUND IN A LOT OF HOMES.THIS HOME HAS 4-5 BEDROOMS, 2.5 BATHS, LARGE OPEN KITCHEN & BREAKFAST AREA, FORMAL DINING AREA OR OFFICE.THE KITCHEN & ALL BATHROOMS HAVE GRANITE COUNTERS, WALNUT AND WHITE PAINTED CABINETRY & STAINLESS APPLIANCES, 10 FT ISLAND IN KITCHEN, ELECTRIC COOKTOP RANGE, MASTER SUITE HAS A WALKIN CLOSET CONNECTING TO LAUNDRY AREA FOR EASY ACCESS TO THE WASHER/DRYER, LARGE TILE WALK-N SHOWER W/BODY JETS. JACK/JILL BATHROOM W/PRIVATE ACCESS TO VANITIES. HARDWOOD BIRCH FLOORS THROUGHOUT MAIN LIVING AREAS W/ A WALNUT STAIN FINISH. THE OPEN FLOOR PLAN CONCEPT & VOLUME CEILINGS GIVE THIS HOME A VERY SPACIOUS FEELING. APPROX. 2,900 SQ FT ON THE MAIN LEVEL PLUS A 700 SQ FT BONUS ROOM THAT COULD BE FINISHED THAT WOULD MAKE AN EXCELLENT MOTHER-IN-LAW SUITE, TEENAGE RETREAT EXERCISE OR MEDIA ROOM. REAR COVERED PORCH PERFECT FOR GRILLING. 3 CAR GARAGE, ROCK/BRICK EXTERIOR. 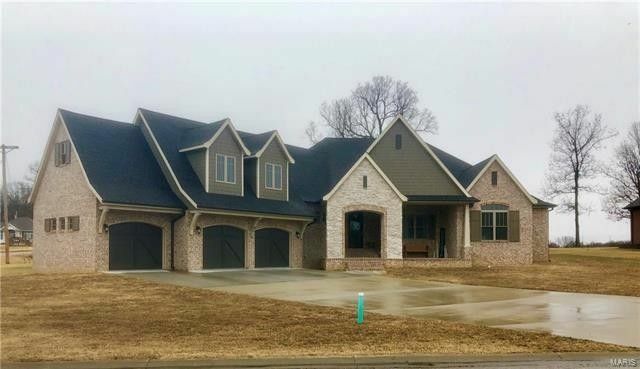 BUILT IN 2017 ON A 1/2 ACRE LOT EASY ACCESS TO I-44. Directions: SOUTH ON HWY 5, LEFT ON MOUNTROSE, RIGHT ON TOWER RD, LEFT INTO CASTLE ROCK ESTATES. HOME IS HOUSE ON THE LEFT AT 901 CASTLE ROCK AVE.